This exhibition features four textile artists from Adelaide - Maxine Fry, Ruth Galpin, Suzanne Gummow, and Sandra Obst. Collage to Stitch is the culmination of one year’s exploration of collage as a tool for developing ideas. The themes chosen and the approaches were personal however, they generally revolved around nature. This exhibition has toured regionally, interstate and internationally and is now here in Auburn. Maxine's love of nature is reflected in her work. 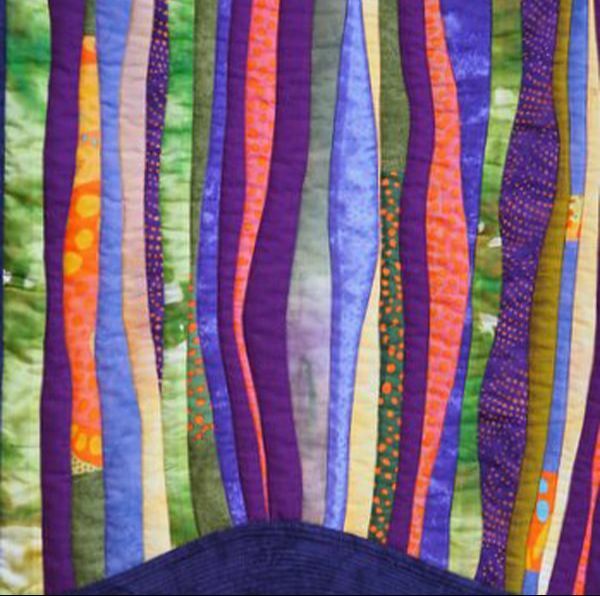 She is an enthusiastic textile artist having come from a traditional quilting background. She loves to travel and takes many photos to inspire her latest pieces. 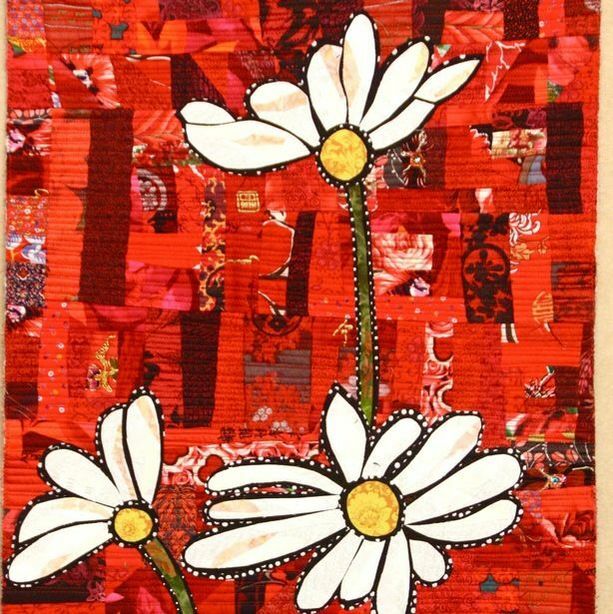 He work has developed from her collection of collage postcards and has extended into more detailed pieces of textile art. Maxine uses the sewing machine etensively in the creation of her work. 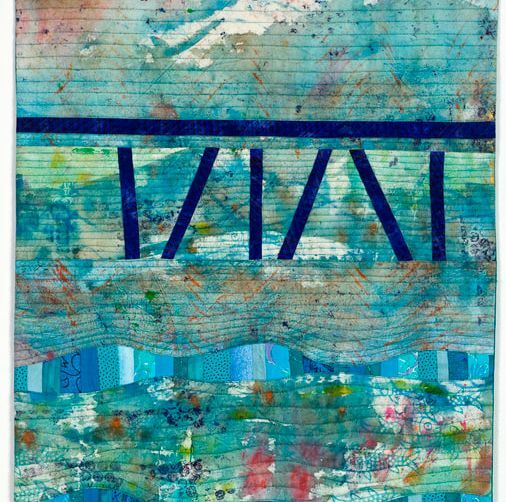 Ruth has a love of the elements of colour, line and pattern and enjoys using repetition and contrast, along with simple printing techniques. She creates art quilts with hand dyed and printed fabric and collages with an assortment of hand made and commercial papers. Suzanne is a passionate textile artist and visual arts educator. Her own practice is inspired by her travels, exotic gardens, all things Asian and soaking up the experiences of many cultures. 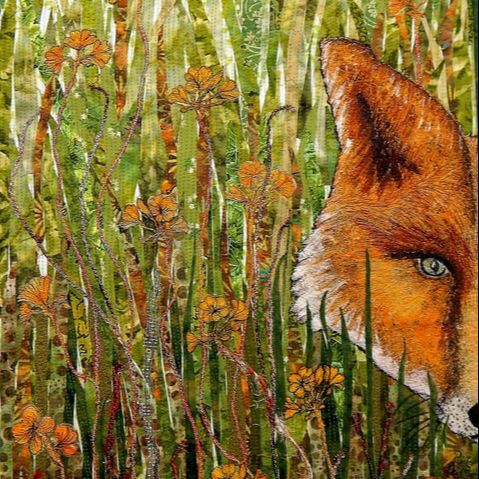 Suzanne creates textile works that involve hand and machine embroidery, embellishment, collage, layering and with the gleam of metallics. She exhibits locally, nationally and internationally. The materials that Sandra uses include fabrics and papers, some old and previously used, and other textile ephemera. Colour and texture enhanced by hand and machine stitch are key design elements. For Sandra the exploration and use of techniques and fibres are not only an aim inthemselves but also a way to create a story with them being the vocabulary. After attending a 'collage workshop' by Carolyn Sullivan, the artists decided to continue their interest in postcard collages. They challenged themselves to make a postcard collage each day or a minimum of four per week and to produce an A4 size piece from either paper or fabric each month. The group met once a month to show their stack of collage cards, discuss their progress and chose a topic to focus on for the next month. Their challenge was to focus on one theme for the month and to work within the limits or focus that they had nominated. The cards were the design stimulation that stretched and grew their creativity and artistry. For the final exhibition the four artists chose four of their designs to extend to larger pieces, working to a standard size of 75cm x 45 cm. Their A4 pieces are also exhibited along with each artists extensive album of postcards. In conjunction with this exhibition Suzanne Gummow will conduct a 2 day workshop in the gallery. See the Coming Events page for details.